On September 20th, the launch of SOL cerveza, took place in the SOL pop-up bar right next to Bar Zuid. This Mexican beer has recently been in the shop and at nightlife. The cozy evening for invited guests was held at the Suriname unique pop-up bar, fully dressed in sunny SOL style. The pop-up bar, a converted container, is staying a few weeks on the Sommeldijck street and will be open every night. The concept of a pop-up bar means that it is constantly moving and in one place for short periods. The guests had a nice evening with the highlight of a dance act where the bar opened and where of course the beer could be tasted. 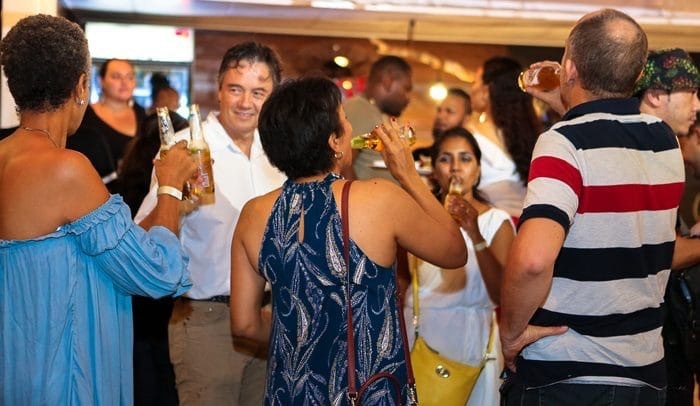 The Innovative and demonstrative Marketing Power of the Surinam Brewery is also that this SOL popup bar is temporarily located in this location. SOL cerveza is an international premium beer with the color of the sun and a delicious fresh taste. SOL has existed since 1899 and the sun over the horizon in the logo symbolizes Mexicans the quest for freedom. SOL is a nice fresh beer and comes in a beautiful 33 cl bottle with an alcohol ratio of 4.5%.